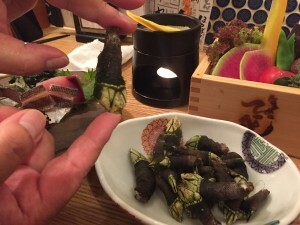 名古屋市昭和区の英会話スクールBigBowEnglishLab > ブログ > A Turtle Hands Surprise! At a seafood restaurant in Nagoya station, the waitress recommended an unusal dish called 亀の手, which literally translates to “turtle hands” in English. I usually love trying new food, but I found this delicacy a bit too strange, even for my adventurous tastes. To eat these, you have to twist and peel off the black skin to get to the meat inside. It was pretty good, but I doubt I would ever order it again. After dinner, I looked up 亀の手 in an online dicitonary to see what these are actually called in English. To my surprise, they are called barnacles! Barnacles are something I imagine someone scraping off the side of a ship’s hull instead of eating for dinner. Soon, Mr. Ito and I are going to take a trip to Spain. I heard from a friend who lives there that barnacles are also eaten in Spain. I’m excited to try new food in Spain, but I know what dish I won’t be ordering!